An efficient waste disposal option, Rubbermaid's 35 Gallon Untouchable Trash Can is constructed from crack-resistant plastic that can hold up to tough outdoor conditions. 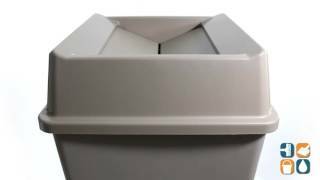 Great for indoor use as well, it is perfect for use in hotel lobbies, offices, restrooms, shopping malls, restaurants, and other public areas, this is the perfect garbage can for high traffic locations. Durable and lightweight, the Untouchable Trash Can offers the ability to serve as a trash can for large offices, as well as individuals. ADA compliant. 19.5" square x 27.6" high. Shipping weight: 9-lbs. Interchangeable tops RCP 2664 BEI or RCP 2664 GRA each sold separately.